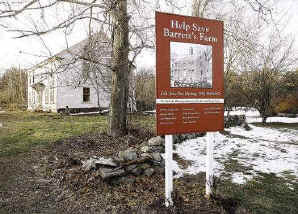 WASHINGTON — Americans celebrate Paul Revere's famed ride, but Barrett's Farm rarely rates a mention. It's a Revolutionary War landmark in Concord, Mass., but has been mostly overlooked. A few years ago, the walls of Barrett's Farm were crumbling. Vines came through the attic windows and under the third-floor floorboards. But today the farmhouse is getting a historic makeover — and Congress could be lending a helping hand. The farm belonged to Col. James Barrett, a leader of the Middlesex Militia. It was used to store colonial militia weapons and was searched by the British during the fighting at Concord's Old North Bridge on April 19, 1775. A major objective of the British march to Concord was to find any military supplies stored at Barrett's Farm. "Everyone around the country knows the story of Paul Revere's ride," said Anna Winter, executive director of Save Our Heritage, the historic preservation group heading up the restoration. "The reason he took that ride was because of this very farm." Sen. Edward Kennedy, D-Mass., is leading the push for a bill to bring the farmhouse under the care of the National Park Service so it can become part of Minute Man National Historical Park in Concord and Lexington. Kennedy considers the farm a national historic treasure, a key site in the start of the American Revolution. "As the munitions store that prompted the British march on Concord and Paul Revere's ride in 1775, Barrett's Farm is among our most historic sites and it should be protected for generations to come," Kennedy said in a statement. When British forces marched from Boston to Concord on April 19, 1775, they were seeking to uncover a major stockpile of weapons and other military supplies they suspected colonial forces had hidden on Barrett's farm. "The farm itself, the property, was a key objective of the British march on Concord," said Jim Cunningham, project manager for the restoration. Barrett was in charge of munitions and other supplies for an army of 15,000, said Cunningham. Barrett's Farm is roughly a mile and a half away from Old North Bridge. About half the British troops were left to protect the bridge while the other half searched the Barrett's property, Cunningham said. The search proved futile. The militia had notice of the British plan, and moved or hid the weapons. Some muskets were hidden in freshly plowed fields. The British were particularly interested in finding four brass cannons that had been stolen from Boston. Cunningham said the brass cannons were the "weapons of mass destruction" of their day, prized for their maneuverability and firepower. Some of the cannons were buried at the edge of the fields behind the farm. Before the British left the farm, they had Barrett's wife serve them breakfast. During the search, Barrett commanded the colonial forces who confronted the British back at the Old North Bridge. "He's the guy who gave the orders to wait until fired upon," said Cunningham. "He was the central figure." The bridge is where Americans for the first time killed British soldiers. A nearby statue commemorates Ralph Waldo Emerson's "The Shot Heard 'Round the World," the poetic tribute to militiamen. Though the fighting was merely a skirmish, it was a turning point in the rebellion. The farmhouse was in tough shape when Save Our Heritage acquired it in 2005 for more than $2 million, Cunningham said. The Barretts had sold it to another family in 1905 and the farm was occupied until 2005, Cunningham said. The restoration will take about three more years and cost about $1.5 million, Cunningham estimated. Funding has come from a variety of sources. The farmhouse includes a muster room that basically served as Barrett's office where he would meet with other military leaders and recruit militia members. Save Our Heritage is striving to be as historically accurate as possible in restoring the property, even using colonial-era construction techniques, Cunningham said. The farm is listed in the National Register of Historic Places and is certified as a nationally significant site, Kennedy noted. 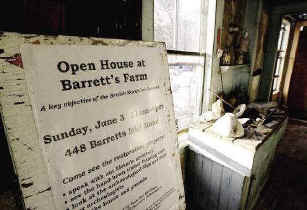 The Senate bill would pave the way for the National Park Service to purchase Barrett's Farm, which spans about five acres, Kennedy said. Winter and other backers of the project are optimistic about the bill's prospects in Congress. "It's an absolutely feel-good piece of legislation," Winter said. Rep. Niki Tsongas, D-Mass., whose district includes Barret's Farm, plans to file a House bill similar to the Senate version authored by Kennedy, an aide said. Sen. John Kerry, D-Mass., who is working with Kennedy to build support for the measure in Congress, said the farm can be a valuable learning tool. "Preserving Colonel Barrett's farm will help future generations learn more about a critical moment in our nation's history, the start of the American Revolution," Kerry said.